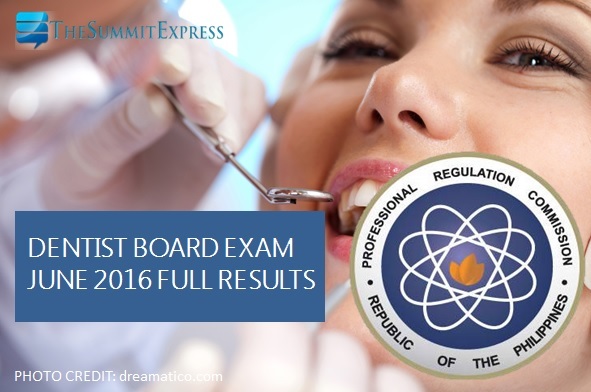 The Professional Regulation Commission (PRC) on Monday, July 4, officially announced the results of June 2016 Dentist board exam. Check out on this page the complete list of passers, top 10 (topnothcers) and performance of schools. A total of 329 out of 734 (44.82%) passed the (Written Phase) and 356 out of 359 (99.16%) passed the Practical Phase given by the Board of Dentistry in Manila last June 28 and 29, 2016. Mickhail Quebec Francisco, graduate of Centro Escolar University (CEU)-Manila dominated the dentist board exam with 85.30-percent grade. From July 11 to July 12, 2016, registration for the issuance of Professional Identification Card (ID) and Certificate of Registration will be done on-line. Please go to www.prc.gov.ph and follow instructions for initial registration. Those who will register are required to bring the following: duly accomplished Oath Form or Panunumpa ng Propesyonal, 2 pieces passport size picture (colored with white background and complete name tag) and 2 sets of documentary stamps. Successful examinees should personally register and sign in the Roster of Registered Professionals. Congratulations to our new dentists!